Last night, President Obama outlined a series of executive actions that will take meaningful, humane, and sensible steps to reform our nation’s broken immigration system. This is a big deal: It recognizes the contributions of millions of people, Americans in all but paperwork, and keeps them from being torn from their families. Republicans have, predictably, come out swinging—threatening impeachment, talking about jailing the president, and worse.1 Over the next few weeks, you’re very likely going to hear some misinformation and faulty assumptions. We all need to be armed with correct information right now—to form our own opinions and to educate friends, colleagues, and even extended family members we may be sharing Thanksgiving with next week. 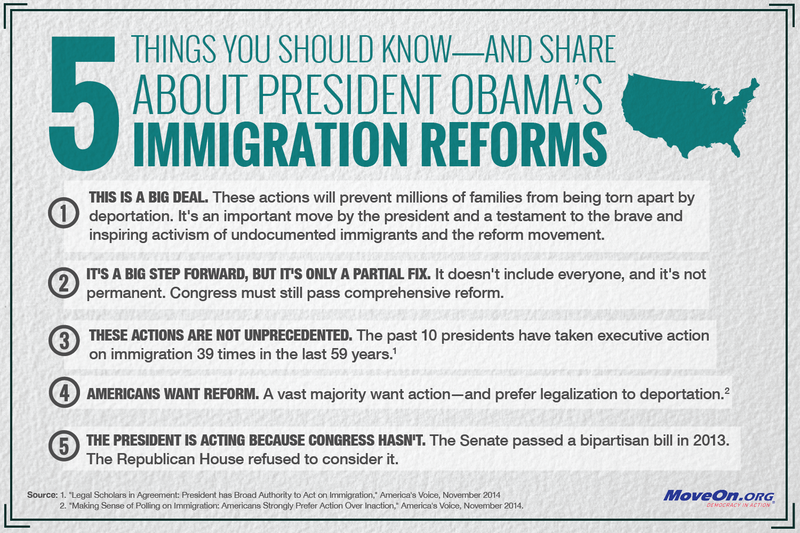 So here are five things to know—and to pass along—about President Obama’s immigration actions. 1. This is a big deal. Providing a mechanism that allows people to live and work in the U.S. without fear makes our country stronger. And it’s the right thing to do: We are a nation of immigrants—and we do well to live the values declared on the pedestal of the Statue of Liberty. 2. This policy is a step forward, but it’s only a partial fix. The struggle will continue until no family fears separation, and all of those living in the U.S. have a path to citizenship. The president’s measures are temporary and leave too many at risk. So while we celebrate that millions of families can now more fully pursue the American dream, we need to keep the pressure on Congress to pass lasting, comprehensive reforms. 3. The president’s announcements are big—but not unprecedented.2 In fact, every president since Eisenhower—Republican and Democrat—has taken executive action on immigration. When President George H.W. Bush implemented the Family Fairness Program, it gave opportunities for deferred action and work authorization to 40% of America’s undocumented population. 4. The American people want reform. Polls have shown a majority in favor of presidential action in the face of congressional inaction. Exit polls on Election Day two weeks ago showed that a majority also preferred finding a legal status for immigrants over deportation.3 You’ll hear other polls quoted that cherry-pick information, but the fact is: Americans want change, and they will support executive action when Congress fails. 5. The president is acting because Congress hasn’t. Leaders of both parties have said our immigration situation is a crisis—yet Republicans in the House have been unwilling or unable to take action. In the summer of 2013, a bipartisan bill passed in the Senate but was killed when House Speaker John Boehner yielded to pressure from his Tea Party members and refused to bring it for a vote. The president, immigration activists, and most Americans want Congress to act—but in the meantime, executive action provides some progress. These actions are the result of tireless and courageous organizing by immigrants and their allies—a reminder that community-led activism can create change—and of President Obama’s decision to go big despite virulent Republican opposition. In the days and weeks ahead, we’ll continue to support meaningful reform, get the president’s back on these forward-looking actions, and fight against the right-wing backlash. For now, though, please review and share this email—forward it to friends, or click here to share a graphic with this information on Facebook—and start conversations … with your neighbors, at your workplace, and even over your Thanksgiving meal. P.S. There will also be a lot of misinformation aimed at undocumented immigrants. Be sure to share this helpful website with any undocumented friends, family members, or neighbors—a useful site as more information becomes available about how to apply for this program. Want to support our work? MoveOn.org Civic Action is entirely funded by our 8 million members—no corporate contributions, no big checks from CEOs. And our tiny staff ensures that small contributions go a long way. Start a monthly donation here or chip in a one-time donation here. This entry was posted in Immigration and tagged immigration, immigration reform, Inequality, Obama, Republicans by Larry Shivers. Bookmark the permalink.